Plants perennial; cespitose, rhizomatous, rhizomes short (less than 1 cm), forming a knotty base. Culms 50-175 cm, erect; nodes glabrous. Sheaths glabrous or pubescent, lower sheaths more frequently pubescent than the upper sheaths; ligules 1.5-3.8 mm; blades to 35 cm long, 2-16.5 mm wide, flat, mostly glabrous, adaxial surfaces with a few long hairs near the base. 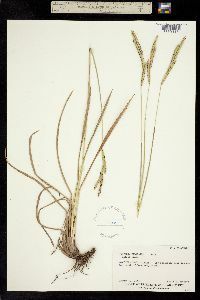 Panicles terminal, with 2-7 racemosely arranged branches; branches 1.5-12 cm, racemose, divergent; branch axes 0.7-1.4 mm wide, winged, glabrous, margins scabrous, terminating in a spikelet. Spikelets 2.3-4 mm long, 1.7-2.5 mm wide,paired, appressed to the branch axes, ovate, tapering to an acute apex, stramineous (rarely purple). Lower glumes absent; upper glumes and lower lemmas 5-7-veined, margins pilose; upper florets stramineous. Caryopses 2-2.3 mm, white to brown. 2n = 20, 40, 50-63. Paspalum dilatatum is native to Brazil and Argentina. It is now well established in the Flora region, generally as a weed in waste places. It is also used as a turf grass. Stout, erect, 8-15 dm; foliage glabrous, or the lowest sheaths sparsely villous; blades to 3 dm, 8-12 mm wide; racemes 3-6, spreading or ascending, 8-12 cm, the panicle much surpassing the reduced upper lf; spikelets ovate, acute, 2.9-3.8 mm; glume pubescent and near the margin long-villous; sterile lemma nearly glabrous; fertile lemma shorter and blunt; 2n=40, 50, 60+. Pastures, waste ground, and occasionally in moist fields or woods, native of S. Amer., cult. and widely escaped in s. U.S., extending n. to Ky. and in the coastal states to N.J.